KHARTOUM - Two Sudanese men have been killed as the country saw its most widespread protests on Thursday during more than a month of continued unrest. The Sudanese Doctors' Committee said medical student Mahjoub al-Taj Majhoub died "after being subjected to beating and torture" while in police custody. University student Abd al-Azeem Babikir, 22, was killed "after a bullet hit him directly in the chest", the committee said in a statement. The government confirmed on Thursday that a 24-year-old man died, taking the official number of protesters killed since anti-government rallies first broke out last month to 29 - though human rights groups say more than 40 have been killed. Live feeds from various Sudanese cities broadcasted images online throughout the day on Thursday. Some of the videos displayed large crowds, while others showed protesters bleeding from what they said were bullet wounds. 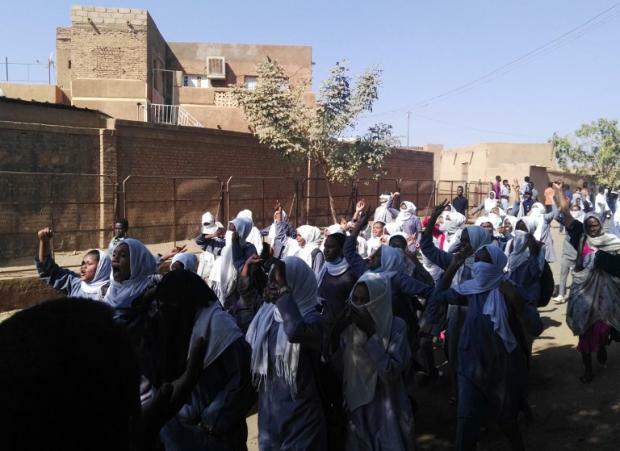 According to the Sudanese Professionals Association (SPA), which has organised regular protests, demonstrations were held in more than 40 areas across Sudan on Thursday. A military source told MEE on condition of anonymity that a member of the intelligence agencies was killed overnight Wednesday. "Now the army is in full control of the city and the security organs have disappeared from the city," he said. An activist from the city, who did not want to be named in fear of reprisals, told MEE they believed a disagreement occurred between the army and the NISS because the army previously protected some protesters. "What happened is a small coup against the control of the security organs [NISS]. Now the army has shown its strength and that's a serious sign if it is be replicated in other parts of the country," the activist said. Police said Thursday that commanders from both groups later stopped the fighting and the situation was "under control". However, another eyewitness in the capital Khartoum said there had also been disagreements between the police and NISS forces in the flashpoint neighbourhood of Burri. On Thursday, hundreds of protesters began demonstrating in Burri, only to be confronted by riot police with tear gas, witnesses said.